If you’ve gone through the process of building a website before, you probably know it can be a painful process – regardless of whether you build it yourself or you pay someone else to create it. Over the past 10 years, we’ve built dozens and dozens of websites for small businesses and personal brand websites for everyone from court reporters and lawyers, to world-class public speakers, and #1 New York Times best-selling authors. Needless to say, we’ve heard all of the horror stories, of people struggling to find a reliable developer to create their website. Too often we were the knights in shining armor, riding in on our white horse to save the day. At PersonalBrand.com, we work with 6 & 7-figure influencers and thought leaders helping them create a world-class personal brand (website included). Our client services are not for everyone, so we do our best to share our perspective, expertise, and experience with you here. If you’re looking to work with our team to create a world-class personal brand website, click here to fill out our application. If you’re not at that level yet, no worries! We’re going to help get you there! 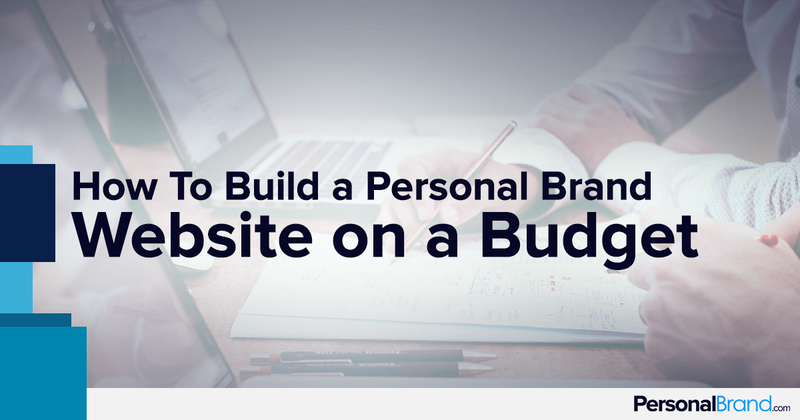 This post is to help identify the pro’s and con’s of the different options you have in front of you for building a personal brand website on a budget. I want to kick this post off with some controversy. 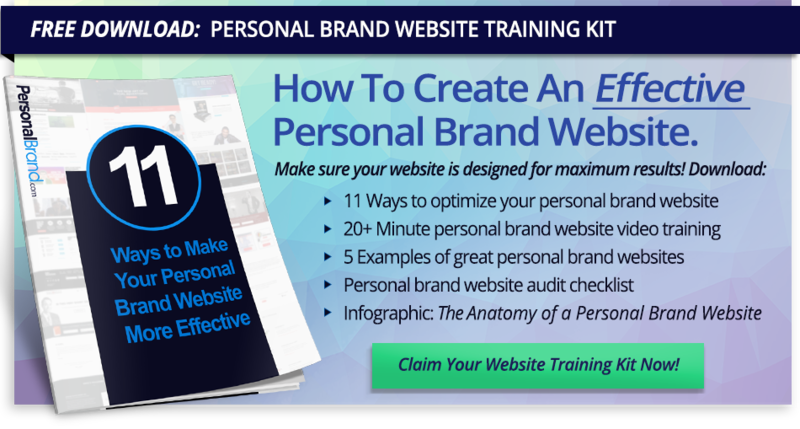 You don’t ACTUALLY need a website, to build a really successful personal brand. Most people think they need a website before the can get started, and actually the opposite is true. In fact, worrying about building and maintaining a website before you’re generating revenue, is a big obstacle and a distraction. Most people think they need a beautiful 10-20 page website up and running in order to make money, but that’s not true. With the current landscape of social media and other software platforms, you can create a simple one-page website, and a series of landing pages to generate leads for your products and services within a few hours. You can drive some serious results just by getting some simple landing pages up and focusing solely on driving traffic to your landing pages through organic and paid social media activities (Facebook, LinkedIn, Instagram, and YouTube – or wherever your ideal client hangs out online). Tools like LeadPages, or InstaPage are great for this. That might be a bit too much of a contrarian view, and you didn’t come here to learn about that scrappy strategy now, did you? And, I also know, regardless of what I say, you’ve got your mind set on building a personal brand website and you’re going to go that route anyways. If I’m wrong, and what I said piqued your interest, I wrote this post for you to learn more about how to get started online without building a personal brand website. The DIY route is the way to save money, but it’s not for the faint of heart. This best for people who currently have more time than money to invest into their personal brand. Luckily, you don’t have to learn HTML and CSS to get a really good looking website up these days. Website builders have come a long way over the past couple years, and tools like Squarespace, Wix, and even GoDaddy website builder can get you some really awesome results without having to know any code what-so-ever. That being said, even though they don’t require technical knowledge, they can still be a HUGE time-sink, and you have to weigh whether or not your time is better spent elsewhere. The downside to most website builders is that they are quite limited when it comes to being able to customize the site and having complete control over making it look EXACTLY the way you want. You can basically shop a bunch of templates, and if you find one you like, you’ll be able to swap out images and content, but you usually wont have complete control over tweaking the layout. This is where WordPress comes in. WordPress is definitely a step up from the website builders I just mentioned, but it allows you both the ability to upload a pre-built WordPress theme, and completely customize anything you want with your website. Having the ability to completely customize your WordPress website some HTML / CSS knowledge would be helpful, but is not required. There are page builder plugins for WordPress too that make it easy to create anything you want. Most of the top WordPress themes, come with a page builder plugin. If you’re a bit technically savvy, I’d encourage you to go down the WordPress path. If you get overwhelmed when Facebook changes their layout, you may want to stick with one of the website builder’s mentioned above. The outsourcing route always sounds like the best option, but can come with it’s own set of challenges. There are three different paths that you can go down when it comes to outsourcing the building of your personal brand website. The reason why outsourcing website development is frustrating for most people, is because they choose the wrong approach. This is the path that most people take. They’re looking for a “Website Guy” that can build them the exact custom website that they want. The challenge is that their vision and their budget usually don’t align, and , more times than not, the developer you choose to work with won’t have all the skill sets needed to turn your vision into reality. It’s very rare that you will find someone that has both the creative skillset to design the website, and the technical skillset to build your website correctly. This is why so many people either have a website that they aren’t proud of (lacking design skills) or they have a beautiful website that doesn’t get results, is buggy, or that they are afraid to update because it might crash their site (lacking technical skills). You only have to hire one person. Usually you can get this done for very inexpensive anywhere from $1,500 – $3,500+. You usually wont get a solid end-product that you’re happy with. You’ll probably have to start over from scratch at some point. Takes a long time because one person is doing all the work and, typically, 1/2 of the work is outside their domain of expertise/passion. You will most likely get very little input from this “Website Guy” on best practices and strategy, they will be looking to you to tell them what you want to create. This is the path that we recommend. As we just identified in the last section, there are really two different skillsets required to create a great personal brand website. The creative / design skillset, and the technical skillset. As we mentioned, someone who is strong in both of these categories is very rare, so that’s why we recommend creating your website in two steps. Step one being, working with a designer to design your website pages, and then taking those designs to a WordPress ninja to turn into a website. This is the process that we take our clients through, and it’s definitely the way to go. You should be able to have a designer design the homepage of your website, and then take that design to a WordPress developer who can turn that design into a functioning website for a relatively inexpensive price. Here you are paying for design, and implementation. The strategy of the website relies on you. About 7% of people choose this option. You will get a little more insight and guidance because each person will have specialized knowledge in their domain. This is the path for the person who has more money than time. You don’t have time to try and find, interview, hire, and manage the project of building your personal brand website. You just want to work with a top-notch team who can hit it out of the park for you, and create a website that not only looks world-class, but also drives business results. This is for those of you who want to work with an agency that can help consult and guide the strategy of your website, create a world-class design, and build your website in a way that is easy for you to make changes on your own, or easy for you to hire the average person familiar with WordPress to make changes. There are a lot of “Website Shops” or development teams and agencies out there, but it’s really important that you work with a company that specializes and understands the business and marketing strategies of building a personal brand business and, most importantly, how and where your website fits into that equation. You may or may not know this, but we actually have an agency side of PersonalBrand.com with a team of talented designers and website developers. We take on about 20 personal brand website clients per year, so if this sounds like the path you want to go down, please fill out our client application and lets have a convo! We are by no means the only option when it comes to building a great personal brand website, just make sure that you know exactly how your website is fitting into your overall business model and marketing strategy. About 10% of people go down the route of having an agency build out their website. Could work with a team that has little knowledge of the “expert / influencer” world and just get a pretty online brochure that generates no business results. To sum it all up, at some point you’ll want to work with a SWAT team to create your ideal personal brand website. Until then, your best two options are to wither DIY it, or take on the “Two-step” process and work with a designer to create a beautiful design, and a developer who can turn that design into a functioning website. It all comes down to how much time, money, and technical skills you have. If you have any questions about your website or our “SWAT Team” level services, please don’t hesitate to reach out: support@personalbrand.com.